Who says blue bedrooms are for boys and pink bedrooms are for girls? While there is nothing wrong with traditional color palettes, a gender neutral nursery is an easy solution that appeals to children (and parents) of any gender identity. Take a look at our most recent collaboration with blogger and IG star Kendall Kremer of Styled Snapshots! 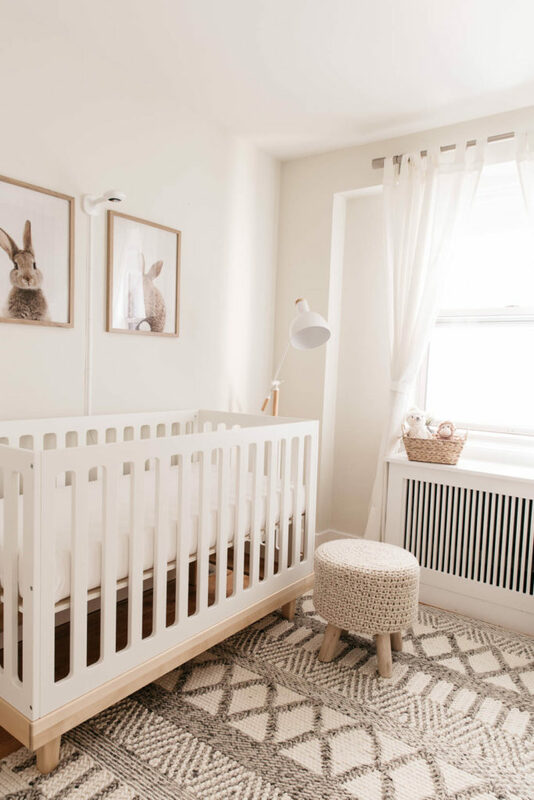 As soon as she knew she had a baby on the way, Kendall reached out to our dedicated team at Kathy Kuo Designs to help her fashion a gender neutral nursery that would please both the baby and the stylish mommy-to-be. The design we came up with may be neutral, but our feelings are anything but! 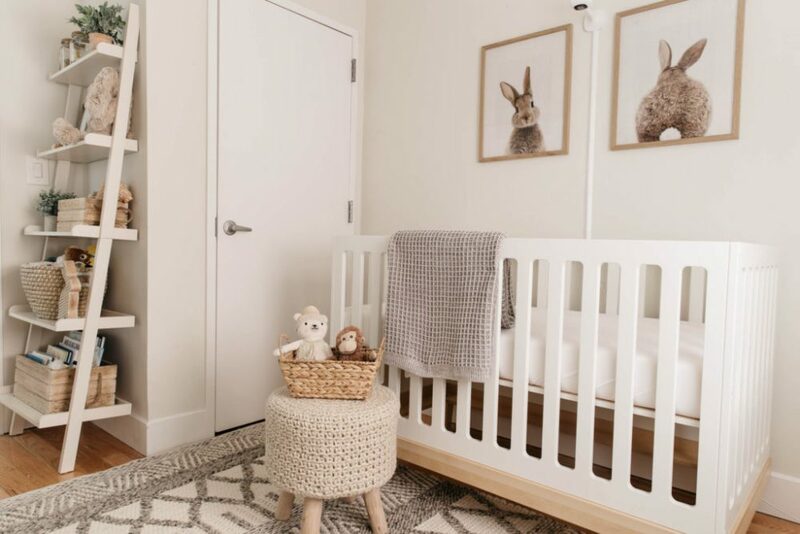 This neutral nursery is chic, serene, cozy, and functional—guaranteed to make the perfect home for Kendall’s little one. 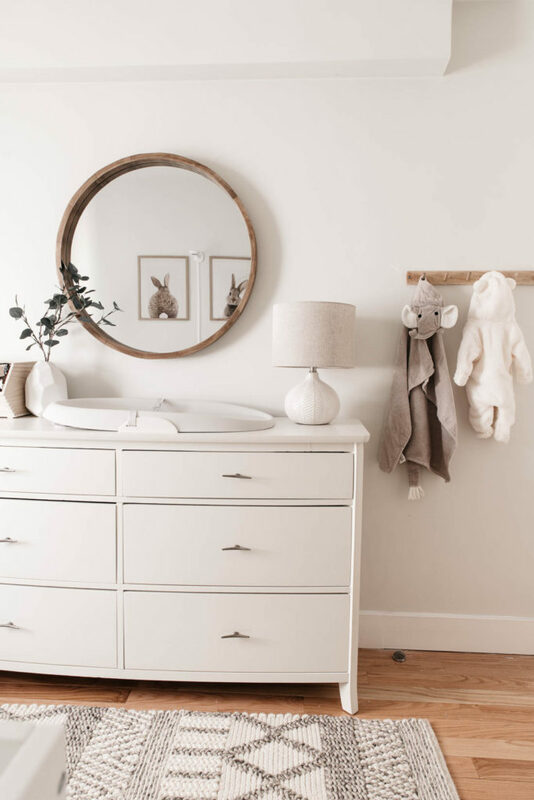 Read more below for a few tips on how to get this gender neutral nursery look! 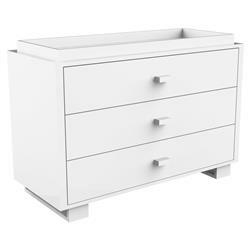 When designing a gender neutral nursery (or any room for that matter), it’s a great idea to do some research and Pin pictures for inspiration. 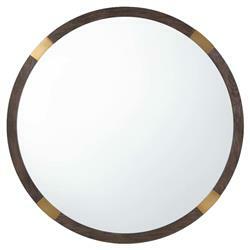 Sometimes all it takes to get the design juices flowing is to find a particular piece that speaks to your style. 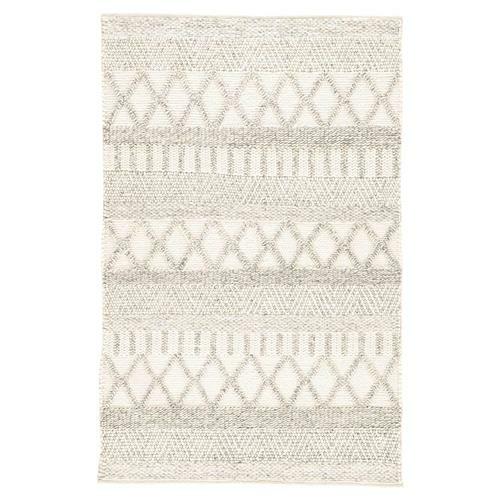 With Kendall, that piece was our gorgeous Louis Ivory Grey Wool Stripe Rug. 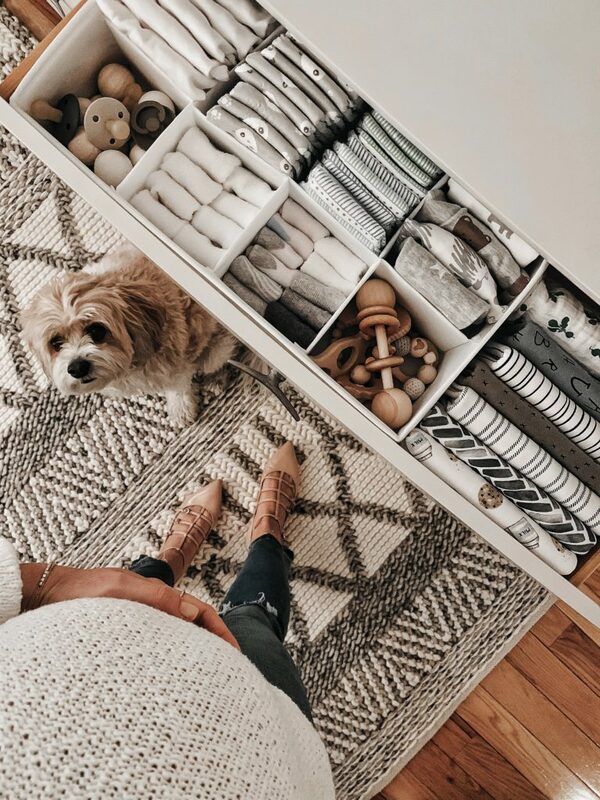 Enamored with the rug’s texture and trendy pattern, Kendall requested that the rug serve as the focal point for the nursery. 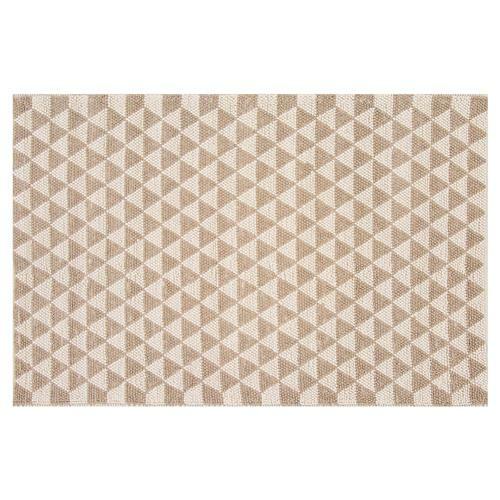 Everything else was selected to complement this rug, so the product specification quickly fell into place. (Pro Tip: A nursery is the perfect room for indulging in design trends you love. Even if a “design moment” passes, chances are you’re going to be changing a few things out from your kid’s room as they grow anyway). 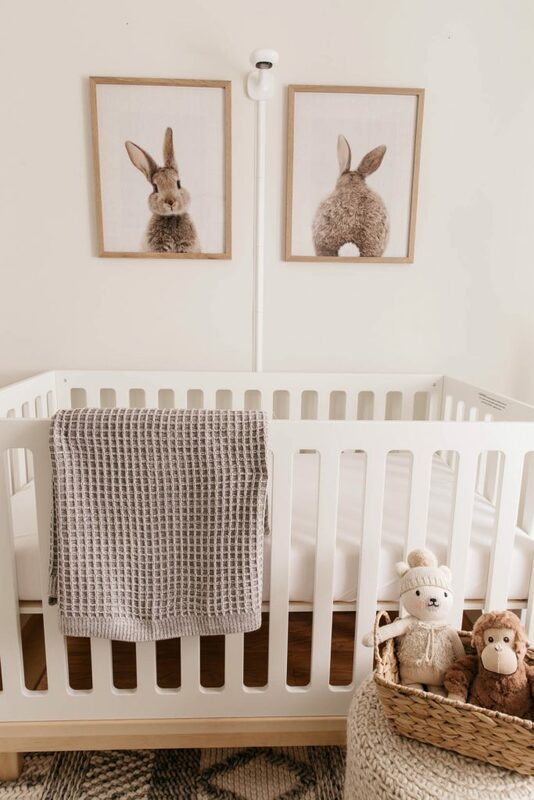 For an updated, gender neutral nursery, keep your palette minimal with whites, light woods and natural greenery, and other neutral tones. 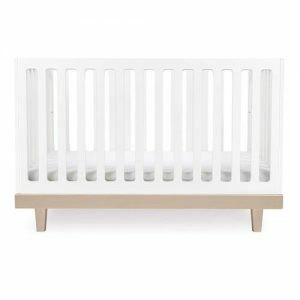 This color scheme will create a clean, airy feel and allow your statement piece to remain the primary focus in the nursery. 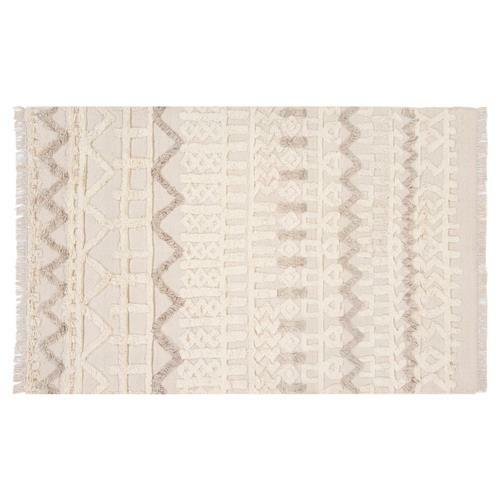 See how the white crib and dresser in our design let the rug shine? Though beautiful in their own rights, they serve to complement the star of the show rather than compete with it. And side note: adding a colorful mobile or colorful toys are encouraged to make sure your little one has lots of visual stimulation even in a neutral space. Just because you’re designing a child’s room doesn’t mean the design can’t align with your style and taste. After all, you’ll be spending time in the space too (and you’ll be able to remember it). 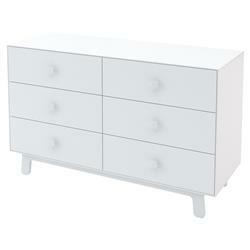 Settle on a design that pleases your style sensibilities. 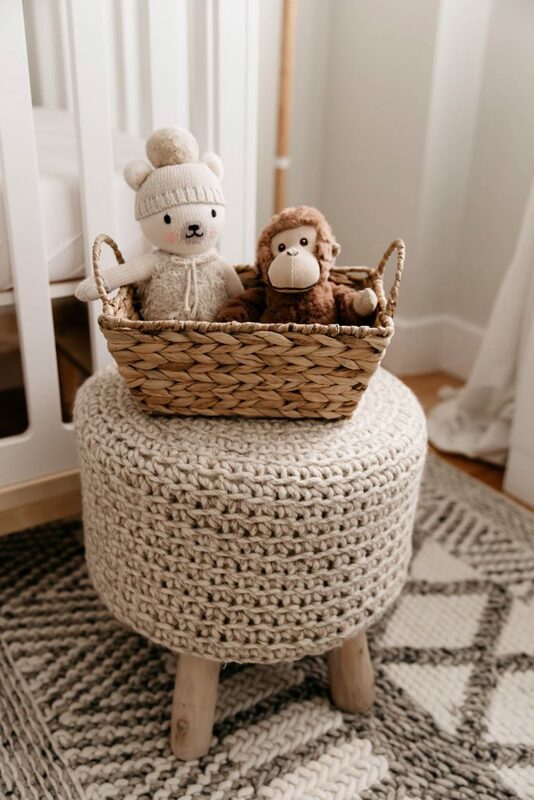 Some of our favorite elements of this nursery design include the use of natural wicker baskets and wood tones. 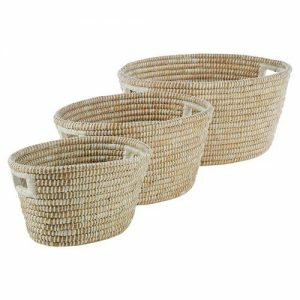 Totally on trend, these baskets also offer plenty of functional storage space for toys and linens. 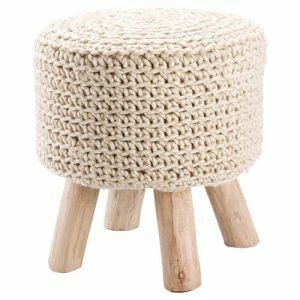 The woven design motif is also echoed in our adorable Mya Stool, the perfect crib-side perch for mom or dad. 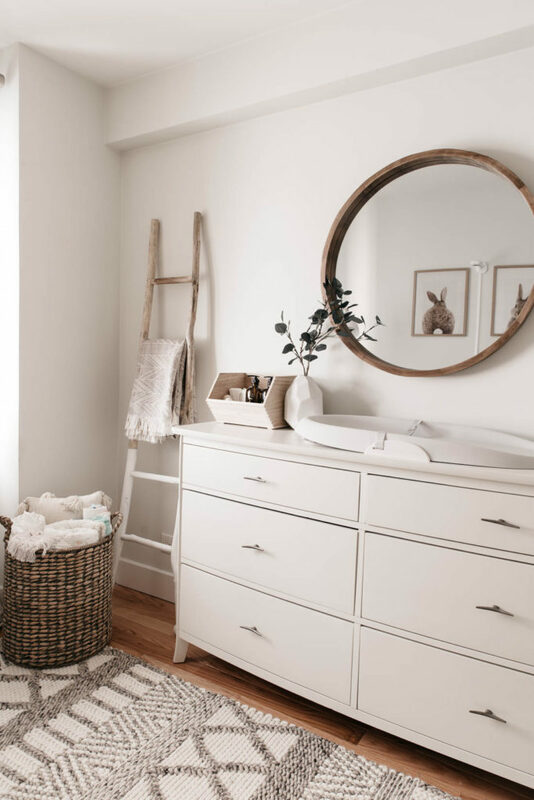 In Kendall’s nursery, a rustic-chic, round mirror looks lovely above a dresser-changing table combo. Let’s squash a common misconception. Just because a nursery is gender neutral doesn’t mean it has to be bland. This is still a kid’s room after all! 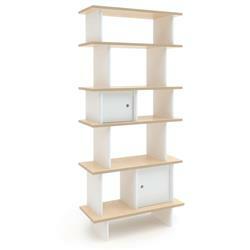 There are plenty of ways to keep a nursery young and vibrant while maintaining your own style and sophistication. 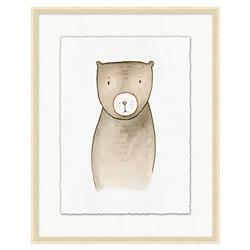 Our go-to strategy is to shop around for the cutest kids artwork and kids toys to add in that element of fun. One nursery design tip we love is to use vintage jars and crates as vessels to organize and display toys, books, and blankets. 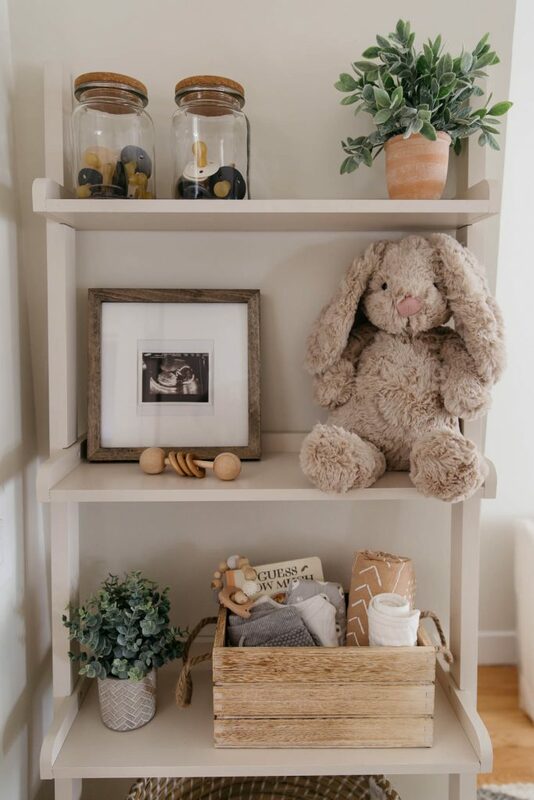 A bit of greenery goes a long way too, whether stacked on an open bookcase or atop a dresser (just make sure decor items are high off the ground and out of arms reach from the crib and changing table!). Love this look? Read more stories on designing the perfect nursery here on the blog!